Lifting Magnets are an ideal solution to lifting loads where only the top surface can be lifted from or in applications where slings and other methods are not acceptable. There are several types of Lifting Magnets that we offer from small hand operated carrying magnets for light object such as sheet metal to large battery operated permanent lifting magnets which can lift up to 3 Tonnes (3,000kg). Cranes-UK supply a versatile range of Lifting Magnets such as models designed for lifting thin plates and models designed for lifting disks. Our team are sure to have a Magnetic Lifting solution to suit. 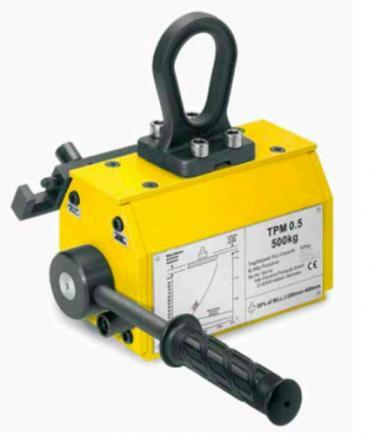 Lifting Magnets are often favoured for use in environments where electricity is not available and where heavy lifting needs to remain fast, effective and safe.